ISO file is an exact copy of a compact disc. It contains all sectors data in the disc. 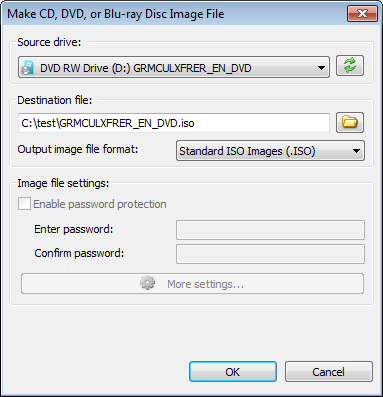 PowerISO can copy the entire disc content to an image file. If the source disc is a single track data disc, it can be saved as ISO, BIN / CUE. or DAA format. However, if the source disc is a multi-track disc, or is not a data disc, it can only be saved as BIN / CUE format. PowerISO will do a sector by sector copying when copying the disc. All information will be copied to the image file. Click "Copy" button on toolbar, then select "Make CD / DVD / Blu-ray disc image file..." from the popup menu. PowerISO shows ISO Maker dialog. Select the desired drive which holds the disc you want to copy from the list. Enter the output file path name, and set output image format to ISO. Click "OK" to start copying disc to the ISO file specified. PowerISO shows the progress information when making the ISO file. After making iso file completes successfully, you should receive a message, "Creating image file completed successfully". You can open the created iso file with PowerISO and browse files in the ISO file.